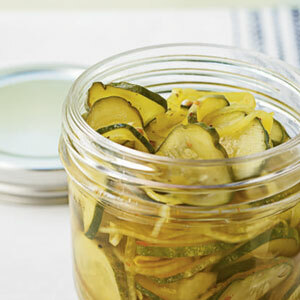 Pickles have always been one of my favorite foods. As a kid I used to eat a snack of pickles dipped in mustard. I am equally fond of dill and sweet pickles, spears and chips, all variety, shape and size. Last night I was going through some old recipes with my Me-me (a Me-me is a southern grandmother by the way) and we found my great grandma's 14-day Pickle recipe in which the cucumbers are soaked for 2 weeks in a huge crock jar. One part of the recipe specifies adding enough salt to float an egg, which I thought was pretty funny. Then my Me-me told me a bizarre story that I felt I must share. Apparently when she was a girl, her mom was making pickles and asked her to help. She believes that something in her body's chemical make-up caused the pickles to get mushy and soft and therefore, she was not allowed to help make pickles anymore. She said that there are certain people who cannot pickle because of this body chemical or mineral. I have combed the internet for any type of information having to do with this and am just baffled. While we were talking about this, someone else added that there are also certain people who aren't able to can tomatoes for the same reason. I'm still googling furiously to get to the bottom of this, but in the meantime...has anyone else ever heard of this? I would be very interested in hearing y'all's theories.